A month has lapsed since the Class of 2026 joined the ranks of other elementary school students. Within that time, each of these kindergartners has probably squirmed in his classroom seat while memorizing a bewilderingly long list of faculty member names. Each has contemplated which lunchroom mother is least tolerant, and has chosen which classmates make the best friends. Additionally, every one has been introduced to an encyclopedia of fictional characters brought to life through the reading of their teacher, debuted an art piece, and may even have a first classroom crush. In short, the ground that all will cultivate for the next twelve years has been broken, and each will continue to squirm in some fashion until he sits in a steel folding chair at a local college arena. 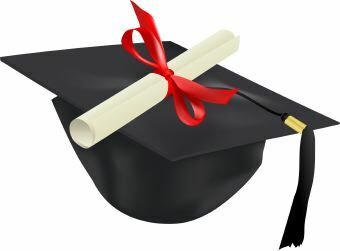 There, every member of the class that is in now in kindergarten will collectively tolerate a final speech by their principal and anticipate the second that they may move the golden tassel from the mortarboard’s right side of to the left. Mission accomplished. Like the Class of 2026, we all have run a seeming rotary of education. Those of us who bore the hardship of schooling began with friendly introductions to simple manuscript before we were mature enough to grasp the mindboggling concept of geometric proofs. At home, we graduated from the simple task of taking the garbage out to the more complicated job of washing the laundry. Last, our initial commencement in the Workplace grew as we managed to comprehend the importance of teamwork, responsibility, and duty. 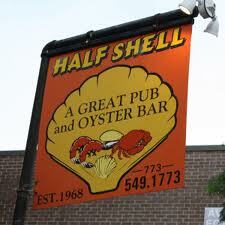 Half Shell, situated in a garden space on the corner of Diversey and Orchard, was her father’s vision. An Istanbul native who received a certificate in structural engineering from the University of Illinois in Champaign-Urbana, he was primarily employed to build bridges along the Chicago expressway. It is the seafood mainstay’s history as well as Candy’s. From the moment she moved her tassel from right to left, she graduated from the simpler tasks of banana dissection and jerking sodas, to oyster opening and pouring draft beers. And as long as the inconspicuously hidden Half Shell door continues to swing open and its bar to fill with seafood-loving patrons, she will continue to utilize her well-sharpened skills. 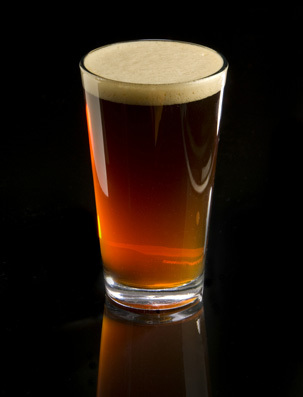 A barroom overture begins simply with the high-pitched note of a lone barstool being slid from under the shelter of the bar to accommodate the evening’s First Player. Removing his blazer and twisting in his seat until he is comfortable, this Principal Chair will call for the Conductor’s attention next to request a favorite draft beer as he chitchats about the day’s goings-on. Eventually, he will note a good friend entering the bar and indicate the empty Second Chair beside him in a staccato-like way, and the Duet Partner will slip into it while calling for a gin martini. Together, the pair begins a wobbly harmony that will last into the night, just as long as the Conductor continually provides the slur of the ale tap and the rat-a-tat of shaken ice. Time is elusive, of course. It will pass as dexterously as a thirty-second note run, and their notes will be distracted by a Third Player who is not part of their melody line. A foreign Fourth Voice will enter the mix, too, creating discordance and possibly dissonance. And this oddly- merged Quartet will increase to become a Quintet, then a Septet, and so on, with each instrument bringing a fresh tone to the barroom symphony. Together, every voice will chant until the earliest hour, when the final barstool is pulled away from its post, the Music Hall is vacant, and the worn Conductor can retire after an evening of hopefully flawless direction. Chef Charlie Trotter, who closed the doors on his eponymously-named institution on August 31, 2012, availed himself on a near-nightly basis to conduct the operetta he had ingeniously written before opening in 1987. From the first moment when an astutely dressed employee slid a chair out for a guest until the chef ultimately dimmed the kitchen lights, he obligingly met the changing tastes of generations, ever striving to maintain his unfailing gift of providing the Exquisite Dining Experience. Gratefully, I can count myself among his symphony members now, as a friend and I were able to bring our voices to his dining room on August 29, 2012, two days before the Conductor packed his baton away. The chef’s homey business environs were located off of a shady stretch of sidewalk on Armitage Avenue, just off of Halsted. Draped with trademark ivy boughs, the restaurant eaves harbored the first gentlemen I met that evening. I walked toward them, nervous and unclear as to which door to enter, and was kindly escorted to left-side entrance, where the door was generously opened. Next, passing through a minute, wooden-floored foyer where others once shook the rain from their umbrellas or removed winter coats, I entered a comfortable front sitting room, where a blond-haired bartender polished the evening’s crystal in front of a bountiful array of wine bottles. His cordial greeting was echoed by the voices of two females, each of whom would proudly avail herself to perform in any capacity throughout the evening. I spoke with one of them after she asked if it were my Trotter’s debut, which it was, of course. She replied that she had worked intermittently at Trotter’s for over a decade and had recently returned to play a role in the closing. Then, smiling cheerily, she continued, speaking of recent guests who had traveled in from faraway states to dine at Trotter’s for a final time. Last, when my guest arrived, she graciously accompanied us up a staircase, around a corner, and into an area so calming that her dutiful offer to slide my friend’s dining room chair out came effortlessly, as if from a genuine friend. Once we rested in our seats and my friend had removed his blue dinner jacket, my attention divided in two, one hungry for good conversation, the other thirstily drinking in the convivial atmosphere. The outer edge of the dining area on which I sat was lined with comfortable blue booths and sat parallel to the solid-looking table at which Charlie Trotter’s band of hosts ably uncorked bottles of wine. To my right, an added partition created a second room that stretched out toward a broad picture window, where green leaves provided natural beauty. Then, eyeing the evenly- paced approach of a young gentleman who bore a small, leather-clad menu, I relaxed in the booth, feeling it yield perfectly to my contour. We received a kind, yet formal, welcome as the carte du jour was splayed against the aforementioned white partition, allowing my friend and I a view of Charlie Trotter’s contrasting bills of fair. The vegetable-based menu de gestation was on the left, and the Grand Menu, which showcased animal protein, was right. An additional wine pairing option was mentioned near the liner. Once each was explained, the server turned away to meet another couple, only, tugging at the cuff of his well-tailored suit before doing so. Alone, my friend and I focused on our options, resulting in his opting for the Grand Menu, and myself, the Vegetable, each with its appropriated wine pairings. What followed was a commendably perfected six-course meal, studiously served over a two-and-a-half hour time frame. Each painstakingly deconstructed and rebuilt course resembled one or two of the elements of a three-course dinner, only improved by the surprise of a new flavor from one delicate bite to the next. Roasted fennel’s subtle flavor would kowtow to cardamom bud. Creamy egg yolk would bring new texture to a richly-hued “haystack” of licorice-accented swiss chard. Each dish held the same promissory note of surprise as does a Cracker Jack Box. Portioning was another study in design, too, enduring as long as the allotted four ounces of wine in one’s crystal stemware. Finally, as we moved from course to course, our fore-polished silverware was swept away and replaced with new utensils, the knife always resting on edge, blade-upward. 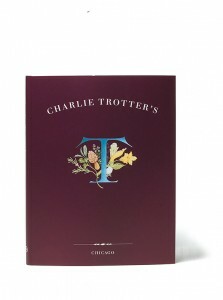 Charlie Trotter’s notion of service was indeed the dinner’s most unique ingredient. A well-informed, suitable team wearing business attire as a uniform was so welcoming and conversant that it was easy to imagine an acquaintanceship with each. From the initial wide-grinned greeting at the front door by the neatly groomed woman to each staff member’s reply to the often-asked question,” Where will you go next?”, it duplicated being at home, only, with an array of dishes unlike anything one’s mother would prepare. Another quality that made Charlie Trotter’s service style a oner was his abolishment of the Front Waiter/Back Waiter/ Busser statuses in lieu of an observant, communicative, impeccably dressed squad who functioned in multiple capacities. Each buzzed as busily as a bee in the beehive, aware of empty plates needing to be cleared away, or stemware that needed replaced or filled. Dinner progressed beautifully, lasting until the final quarter-teaspoon of sherbet had been spooned up and our crystal stemware was drained of dessert wine. Then, the amicable chef patissiere, who had visited throughout the evening to replenish our bread plates with her dainty, housemade rolls, indulged us with a generous Once-In-A-Lifetime look-see at Charlie Trotter’s famous kitchen. Eagerly consenting, we drew ourselves from our comfortable posts and followed her past the Sommelier’s Station to the decoratively wallpapered hallway through which we had originally entered. We rounded the corner and descended the staircase. 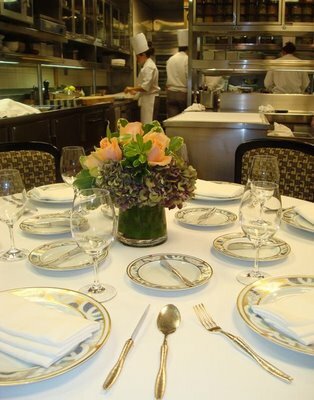 She graciously open the kitchen door for us once we neared it and led us into Charlie Trotter’s most magical room. One of its most famous features, a picturesquely set table, was the first sight, and it established its celebrity status immediately. Those fortunate enough to reserve it over the decades were afforded the lucky opportunity of watching the famous chef at work while being spoiled with a special menu de degustation as well. Leading us further into the remarkably neat, silent space, we were treated to all areas of procurement next and watched as the small, seasoned ensemble arranged the various pieces of the same, edible puzzle that we had just enjoyed ourselves. Finally, she escorted us through another door and into yet another dining area that was furnished with a most grandiose table and proudly situated in front of Chef Trotter’s Large Format Cellar. Here my friend and I had our photo snapped. The evening nearly over, we allowed ourselves to ask the chef patissier of what her future held. She confessed to the same plan as the others, resting a bit and taking the time to reflect upon and digest the enormity of her life in Trotter’s kitchen. It was a sad moment, but hopeful, too. Last, she thanked us for the visit and opened the door for a final time. Stepping onto Armitage Avenue once again, we listened as it gently swung shut. 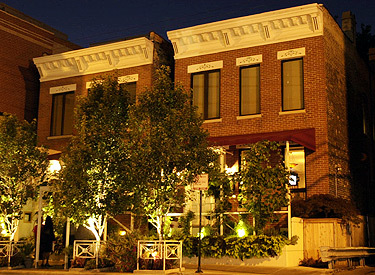 Although Charlie Trotter’s eponymous establishment would essentially remain alive for another day of so, sentimentally, we knew it was our last visit. For, on August 31st, 2012, the same back door would click shut behind its last guest, in time with the sight of The Conductor retiring his baton forever.